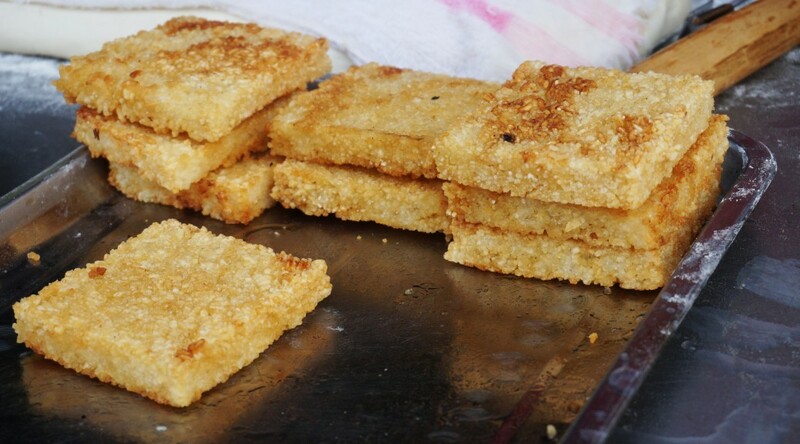 Often served alongside various deep-fried bings and youtiao, cí fàn gāo (Chinese: 粢饭糕) is a rectangular block of compressed glutinous rice that is fried until golden brown. It is often eaten as a savory breakfast snack during autumn, when the rice has just been harvested. Glutinous rice is cooked with water, seasoned with salt and deep-fried in oil. The glutinous rice is steamed and then kneaded and seasoned with salt. The mixture is compressed into cakes and cut into rectangles before being deep-fried. During the Spring and Autumn Festival, a man named Wu Zi Xu wanted to help people who were suffering from hunger after the war. He shaped sticky rice in the form of a condensed brick and buried it in the ground so that people could eat it in case of emergency. While their city was being invaded by emperor Guo Jian, the trapped inhabitants were able to eat the bricks of glutinous rice that were previously buried into the ground in order to survive. The people dug the bricks of rice out of the ground and deep-fried it before eating it. From that time on, people continued to make this dish during the Autumn Festival in remembrance of their hero.